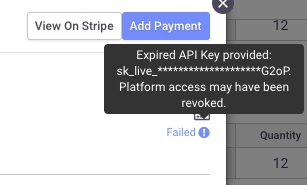 When viewing a Failed payment on an Invoice, you may see the error message that says "Expired API Key provided: sk_live_******. Platform access may have been revoked." This means that there was an error in the connection between Brandboom and Stripe. You can either try running the payment again or going to your Settings page to re-connect your Stripe account.